Today I bring you my thoughts on the Benefit They're Real! Push-Up Eye Liner. 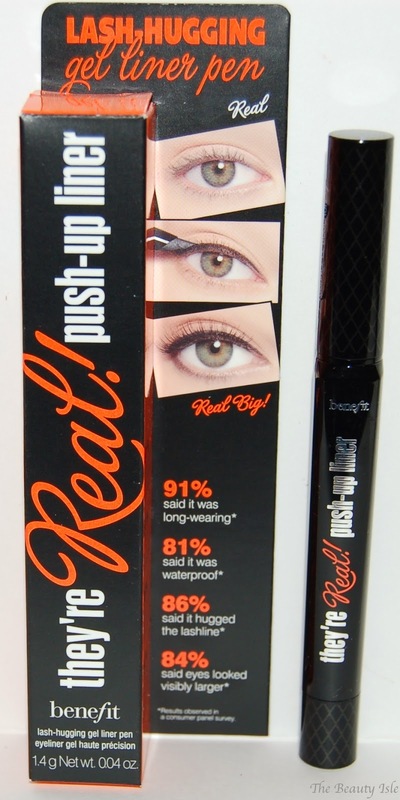 One of Benefit's best selling products is their They're Real! Mascara. Because of all the love for the mascara, when this eye liner came out, it had a ton of hype. I personally prefer liquid eye liners over gel liners. I just can't get the hang of maneuvering such a thin brush to apply a gel liner. I gave this gel liner a shot because of it's innovative applicator. Benefit They’re Real! Push-Up Liner is the first foolproof and budge-proof gel liner in a pen that lasts a full 24 hours. This eyeliner’s soft AccuFlex™ tip is custom-angled to draw an easy line. Its flat, wide guard gently pushes lashes aside to get close to lash line. A gorgeous way to open up eyes, this matte black gel formula won’t dry out, and its cutting-edge tip ensures a precise line every time. This applicator of this eye liner is a soft plastic material. The gel comes out of the tip by twisting the bottom of the tube. It's true, the formula of this gel is very matte and VERY black. Once it's on the eye, it doesn't budge and you need waterproof makeup remover to remove it. Sidenote: There is an $18 They're Real! Makeup Remover to go along with this eye liner. It's totally unnecessary. I found that my drugstore waterproof makeup remover removes this gel just fine. The application of this liner is extremely difficult. Twist up the product too much and you've got a big glob of gel on your eyelid. But more often than not, I'm twisting up too little at a time and it takes forever to get just the right amount out of the tip to be able to draw a complete line. There are times that after several tries, I do get it right and the liner looks great because it's so dark and matte. However, that is rare. Typically this eye liner looks choppy and it's next to impossible to get an even look on both eyes. I absolutely cannot do a wing with this eye liner. The product sort of balls up on the side of my eyes and flakes off. I've had this eye liner since the fall and I feel I've given it a fair shot of several months of trial and error. The Benefit They're Real Push-Up Liner is a fail for me. The applicator is a total gimmick in my opinion. I will stick to my liquid eye liner pens. This product retails for $24 and can be found anywhere that Benefit products are sold including Sephora and Ulta. Have you tried this product? If so, has it worked out for you?